KATHMANDU, Nov 1: Two major political forces in Madhes -- Rastriya Janata Party Nepal (RJPN) and Federal Socialist Forum Nepal (FSFN) -- have finalized the constituency allocation deal between them for the upcoming elections in 32 constituencies of Province 2. The two parties have also finalized the constituencies for the topmost leaders of both parties for the December parliamentary and provincial elections. 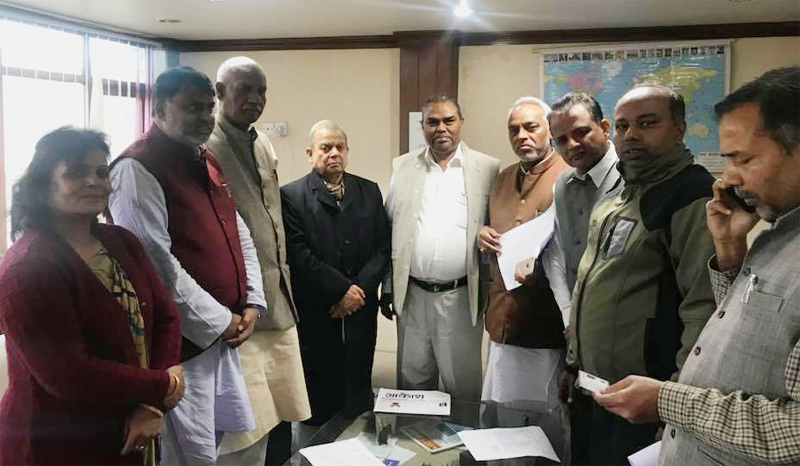 FSFN Chairman Upendra Yadav and RJPN Chairman Mahantha Thakur inked a deal Tuesday allocating 17 House of Representatives and 17 provincial assembly constituencies for FSFN and 15 parliamentary and 31 provincial constituencies for the RJPN. After striking the alliance deal, both parties held a meeting with the Nepali Congress (NC) to finalize their alliance with the party. The two parties have not ruled out the possibility of electoral adjustments with the NC, but the meeting on Tuesday failed to reach any agreement, said the leaders. “We are still open for poll adjustments with the NC in some constituencies if the ruling party agrees to support our candidates in other constituencies,” said RJPN leader Manish Kumar Suman. FSFN Chairman Yadav has decided to run for parliament from Saptari-2 and RJPN Chairman Thakur from Mahottari-3. Though some RJPN leaders had requested Thakur to contest for a provincial assembly seat projecting him as a potential chief minister of Province-2, Thakur refused the proposal, said leaders. RJPN presidium member Rajendra Mahato is likely to run for parliament from Sarlahi-4, Mahendra Raya Yadav from Sarlahi-2, Sharat Singh Bhandari from Mahottari-2 and Anil Yadav from Rautahat-1 and Raj Kishor Yadav from Siraha-4, according to the party leaders. FSFN has unveiled all candidates for the parliamentary and provincial assembly elections, subsequently after the two parties allocating constituencies in the Province-2 on Tuesday. According to a statemt issued by the party, senior leader Ashok Rai is set to contest from Sunsari-1, and General Secretary Ram Sahaya Yadav from Bara-3. Noted youth leaders of the RJPN, Manish Kumar Suman and Keshav Jha have decided to contest for provincial assembly eying the chief executive post of Province -2. According to an agreement between the two Madhes-based political parties, FSFN will field its candidates from constituencies 1, 2 and 3 of Parsa, 2 and 3 of Bara, Rautahat-2, Sarlahi-3, Mahottari-1 and 4, Dhanusha 1, 2 and 4, Siraha 1, 2 and 3 and Saptari 1 and 2. Similarly, the RJPN has been given Parsa 4, Bara 1 and 4, Rautahat 1,3 and 4, Sarlahi 1, 2 and 4, Mahottari 2 and 3, Dhanusha 3, Siraha 4 and Saptari 3 and 4. FSFN will field its candidates for provincial assembly in Parsa 1(1), 1(2), 2(1), 3(1), 3(2), and 4(2), Bara 1(1), 2(1), 2(2), 3(1) and 1(2), 2(2) and 3 (2) of Rautahat. Similarly FSFN will field its candidates for provincial assembly from Sarlahi 2(2) and 3(2), Mahottari 1(2), 4(1) and 4 (2), Dhanusha 1(1), 2(1), 2(2), 4(1) and 4(2). The party has been allocated 1(1), 2(1), 2(2), 3(1) and 3(2) of Siraha and 2(1), 4(1) and 4(2) of Saptari for provincial assembly nomination. RJPN will contest from the remaining 31 provincial assembly constituencies in the Province 2.